Sharing our passion for the love and care of deaf dogs. You Can Make A Difference in a Deaf Dog's Life! 100% of donations go directly to helping deaf dogs and their owners. Meet adoptable deaf dog Pongo who is looking for a loving home with someone who will love him and always keep him safe. I was a special rescue for PPR because I was about to be euthanized and PPR stepped in and saved me! How lucky for me and my future forever family! I’m just about a year old. I may be deaf but that doesn’t stop me from learning and thriving! My foster family uses hand signs to signal what they want me to do. I’ve picked up on those really quickly! I’m pretty smart! I also love to play with other dogs and my bff is a cat! I live with 3 human children 15, 10, and 5 months and love them all. I am working on my potty training and crate training. I am known to occasionally steal things off the table that I shouldn’t but I’m working on my manners. I am pretty easy going and would do great with any family that would be willing to be patient and teach me. I love going on adventures but also love snuggling up on the couch. I’m a pretty well rounded guy. I am neutered and up to date on vetting. Helping deaf dogs since 2010 - a community 61,000 strong, we've learned what products work well. © 2019 Deaf Dogs Rock, Inc.
NOTICE: Deaf Dogs Rock is a directory of deaf dogs in need of homes. Some deaf dogs are with rescue organizations or private owners. No information on Deaf Dogs Rock is guaranteed. Although the information on DeafDogsRock.com is updated frequently, it is always best to call the facility, organization, or private owner that lists the deaf dogs with us to ensure it is still available and to ensure that the information listed on DeafDogsRock.com is accurate. It is crucial that any pet found through an adoption service be thoroughly examined by a veterinarian immediately upon adoption. 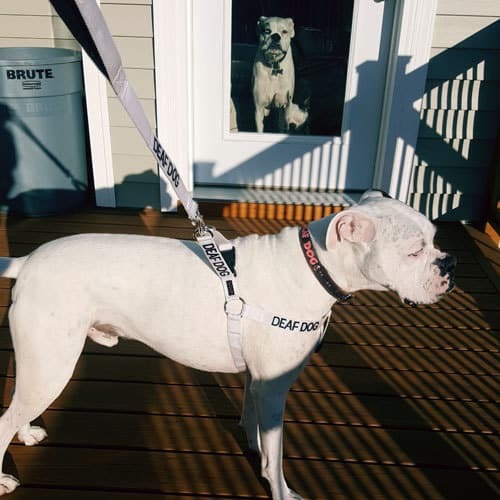 Any deaf dogs found, adopted through or listed on DeafDogsRock.com are the sole responsibility of the adoption organizations and/or the adopting party. Deaf Dogs Rock accepts no responsibility for any liability or for any injury or damages to any person or property caused by any listed deaf dog, as well as any cause of action, claims, suits or demands whatsoever that may arise as a result of such injury or damage.